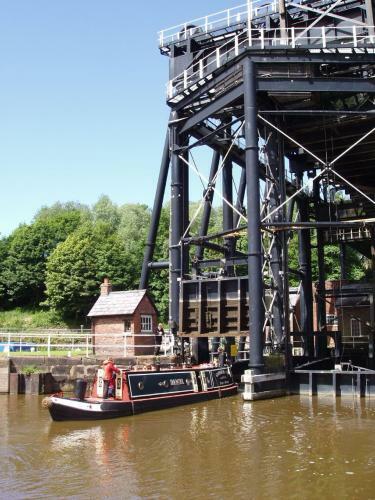 The Anderton Boat Lift near the village of Anderton, Cheshire, provides a 15 m (50 ft) vertical link between two navigable waterways - the River Weaver and the Trent and Mersey Canal. 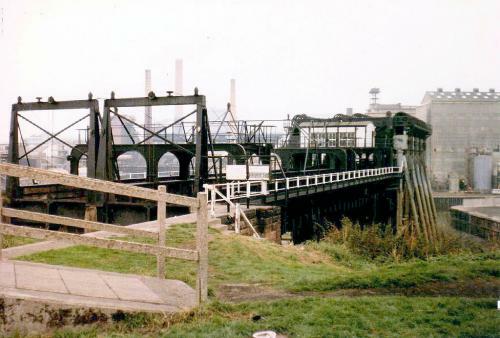 Built in 1875, the boat lift was in use for over 100 years until it was closed due to corrosion in 1983. Salt has been extracted from the rock salt beds underneath the Cheshire Plain since Roman times. By the end of the 17th century a major salt mining industry had developed around the Cheshire "salt towns" of Northwich, Middlewich, Nantwich and Winsford. The completion of the River Weaver Navigation in 1734 provided a navigable route for transportation of the salt from Winsford, through Northwich, to Frodsham, where the Weaver joins the Mersey. The opening of the Trent and Mersey Canal in 1777 provided a second transport route, which ran close to the Weaver Navigation for part of its length, but extended further south to the coal mining and pottery industries around Stoke-on-Trent. Rather than competing with one another, the owners of the two waterways decided that it would be more profitable to work together. In 1793 a basin was excavated on the north bank of the Weaver, at Anderton, which took the river to the foot of the escarpment of the canal, 15 m. above. Facilities were built for the trans-shipment of goods between the two waterways, including two cranes, two salt chutes and an inclined plane. 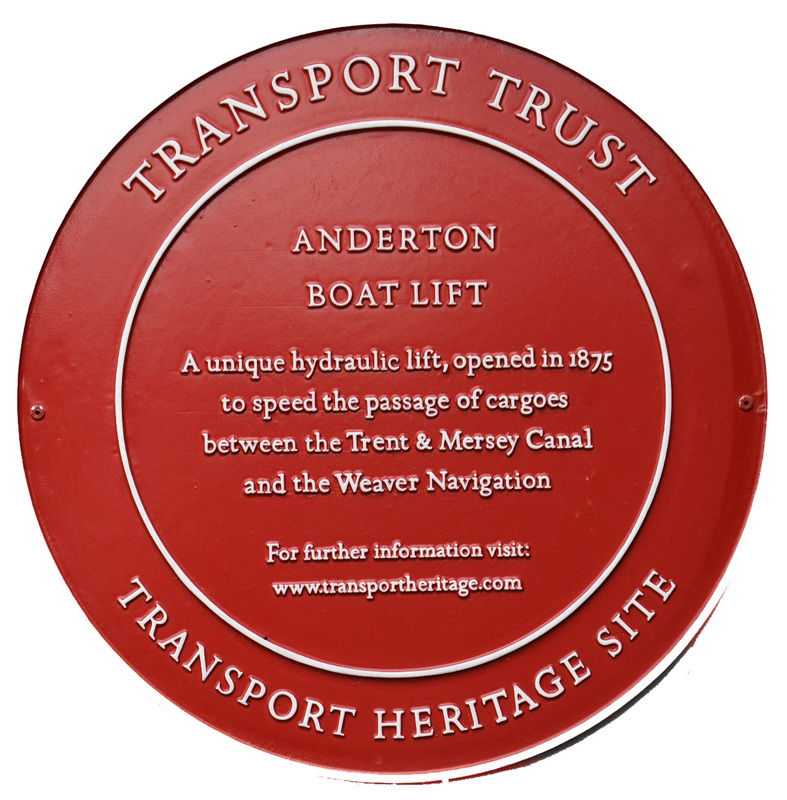 By 1870 the Anderton Basin was a major interchange for the trans-shipment of goods in both directions. However, trans-shipment was time-consuming and expensive, and the Trustees of the Weaver Navigation decided that a link between the two waterways was needed to allow boats to pass directly from one to the other. A flight of canal locks was considered but discarded, mainly because of the lack of a suitable site and the loss of water from the canal that would have resulted from operating locks. In 1870 the Trustees formally proposed a boat lift between the waterways. The Trustees asked their chief Engineer, Edward Leader Williams, to draw up plans for a boat lift. Leader Williams considered various ideas and finally settled on a design involving a pair of water-filled caissons, which would counter-balance one another, and so require relatively little power to lift boats up and down. Leader Williams realised that if he used water-filled hydraulic rams to support the caissons, the weight of the caissons would be borne by the rams and their cylinders, and a much lighter superstructure could be used. Having decided on a hydraulic ram design, Leader Williams appointed Edwin Clark as principal designer. The two wrought iron caissons could each accommodate two narrowboats or a single barge. 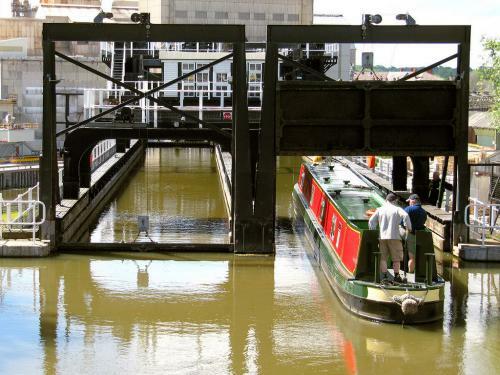 At the upper level the boat lift was connected to the Trent and Mersey canal via an aqueduct, with vertical wrought iron gates at either end. 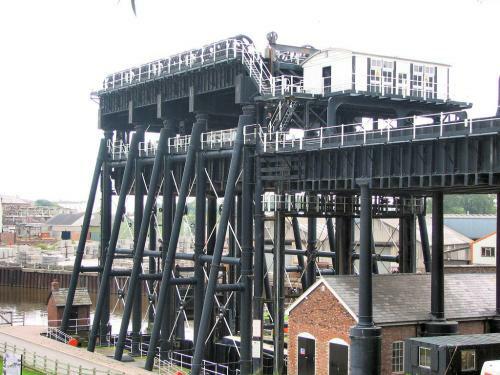 The Anderton Boat Lift was formally opened to traffic on July 26, 1875. 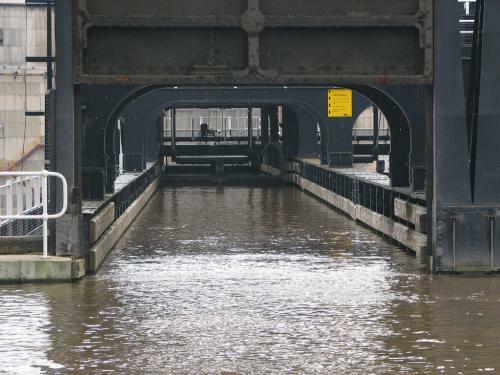 For the first five years of its life, the boat lift operated successfully, with the longest closures being during spells of cold weather when the canal froze over. However, in 1882 one of the cast iron hydraulic cylinders burst while the caisson that it supported was at canal level with a boat in it. The caisson descended rapidly, but fortunately the water escaping from the burst cylinder slowed the rate of descent, and the water-filled dock at the river level softened the impact. No-one was hurt and the superstructure of the lift was not damaged. During subsequent testing, the second cylinder failed too, and the boat lift was closed for six months while sections of both cylinders were replaced and the connecting pipework, which was thought to have contributed to the cylinders' failure, was redesigned. Volumes of traffic through the lift grew steadily through the 1880s and 1890s, but the hydraulic cylinders continued to give problems. Over the next few years maintenance and repairs took place with increasing frequency, each occasion requiring either the complete closure of the lift for several weeks or a period of reduced and slower operation with a single caisson. The Trustees asked their Chief Engineer at the time, Colonel J.A. Saner, to investigate alternative solutions. Saner proposed an innovative solution in which the hydraulic rams would be replaced by electric motors and a system of counterweights and overhead pulleys, allowing the two caissons to operate independently of each other. Although this system involved many more moving parts than the hydraulic system, these would all be above ground and easily accessible, so it offered easier and cheaper maintenance and a longer working life. As the entire weight of the caissons and counterweights would now be borne by the superstructure of the lift, this would have to be greatly strengthened, and put on much stronger foundations. However, by building a separate stronger superstructure around the original lift frame, Saner promised to achieve the conversion with only three short periods of closure to traffic. The new superstructure consisted of ten steel A-frames, five on each side of the lift, which supported a machinery deck 18 m above the river level. In addition to new foundations and superstructure, the conversion also involved converting the wet dock at river level into a dry dock and strengthening the aqueduct between the lift and the canal. The original caissons were retained, but modified to take the wire ropes that now supported them on each side. The conversion work was carried out between 1906 and 1908. As Saner had promised, the lift was only closed for three periods during these two years, for a total of 49 days. The converted lift was formally opened on July 29, 1908. 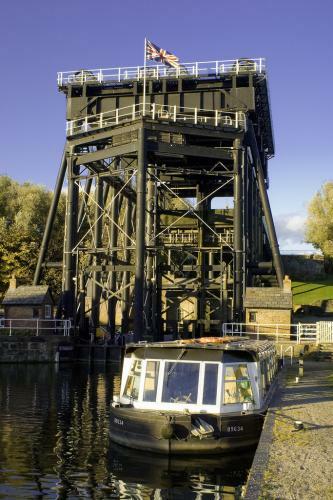 After conversion to electrical operation the boat lift was successfully operated for 75 years. During the 1950s and 1960s the commercial traffic on British canals declined. 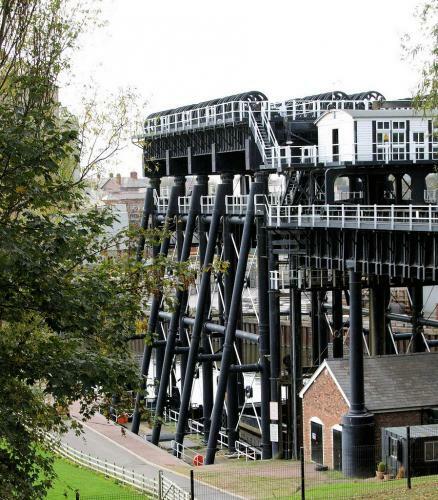 By the 1970s the Anderton Boat Lift traffic was almost entirely recreational, and it was almost unused during winter months. During repainting work in 1983 extensive corrosion was found in the lift's superstructure, and it was declared structurally unsound and closed. During the 1990s British Waterways carried out preliminary investigations prior to launching a restoration bid. At first it was announced that they intended to restore the lift to electrical operation but in 1997, after consultation with English Heritage, it was decided to restore the lift to hydraulic operation. Restoration commenced in 2000 and the lift was re-opened to boat traffic in March 2002.